Healthy skin is happy skin. 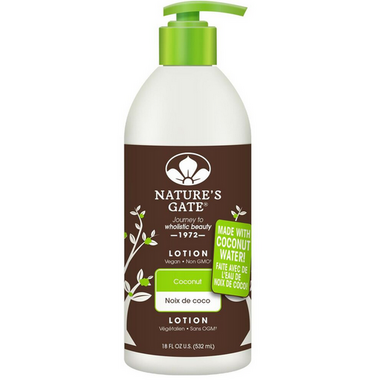 Nature's Gate Coconut Body Lotion gently moisturizes skin. Nature’s Gate believes it’s not only essential what you put in your body but what you put on it as well. Directions: Apply liberally to body. Smooth into skin. Reapply to dry, rough chapped areas. For best results, use daily. FOR EXTERNAL USE ONLY. AVOID DIRECT CONTACT WITH EYES. Ingredients: Water, Caprylic/Capric Triglyceride, Glycerin, Glceryl Stearate SE, Cetyl Alcohol, Stearyl Alcohol, Cocos Nucifera Water, Cocos Nucifera Oil, Cocos Nucifera Fruit Extract, Butyrospermum Parkii Shea Butter, Aloe Barbadensis Leaf Juice, Mangifera Indica Fruit Extract, Cucumis Melo Fruit Extract, Hylocereus Undatus Fruit Extract, Musa Paradisiaca Fruit Juice, Passiflora Incarnata Flower Extract, Bertholletia Excelsa Seed Extract, Leuconostoc/Radish Root Ferment Filtrate, Allantoin, Caprylhydroxamic Acid Cetearyl Glucoside, Xanthan Gum, Tocopherol, Benzyl Alcohol, Phenoxyethanol. Fragrance*. *Phthalate free/sans phtalates. I bought this product at Save-On-Foods. Absolutely love it. I have extreme dry skin. This is one of the best. I have tried many different brands. I am over 50 and have lived with skin problems all my life. No problems in promoting this product. It is almost 100% pure product, that smells great, and people with perfume problems will probably be okay with it. My skin is not itchy after applied and it restores the moisture in the skin. Give it a try.